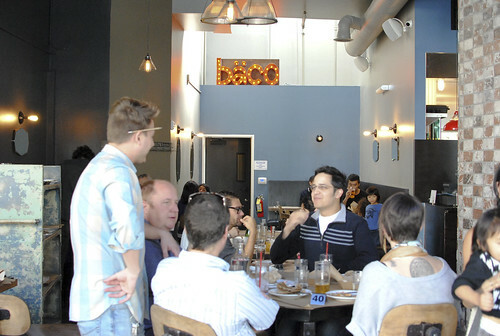 Bäco Mercat is the latest offering from Josef Centeno (Lazy Ox Canteen), a casual spot in the up-and-coming Arts District serving up a menu based on something called the baco, as well as savory flatbreads and some small plates. 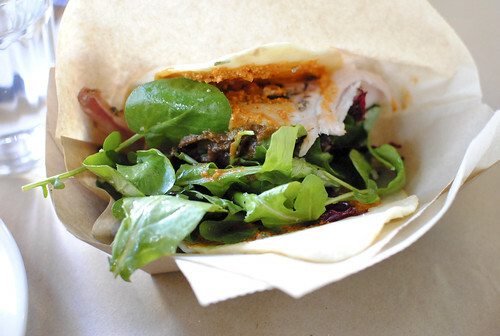 The bäco is Centeno’s own creation, a sandwich made up of various meat and sauce combinations rolled up into a tortilla-like flatbread (advertised as a “sandwich-taco-pizza hybrid”). 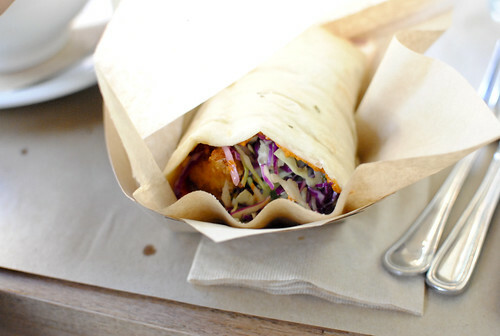 To me, they resemble a loosely-wrapped burrito or gyro. I’ve heard great things about these baco, which occasionally popped up wherever Centeno was cooking. So when it was announced there would be a restaurant dedicated to this sandwich (walking distance from the office and where I live), I was excited. 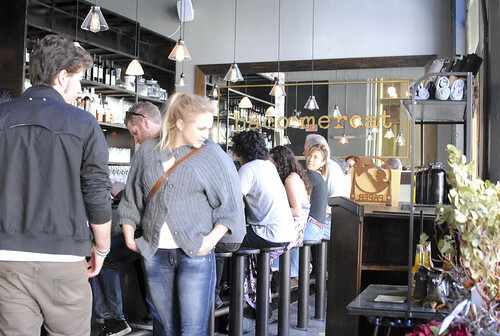 I dropped by for lunch during their soft opening – the grand opening is planned for Monday the 14th. Prices are very reasonable, with the bazole soup being the most expensive thing on the menu at $10. However, one item (i.e. one baco) probably isn’t enough food for a meal. We started with this interesting soup. The soup was based on a traditional pozole, spruced up with noodles, a fried egg and chunks of meat. 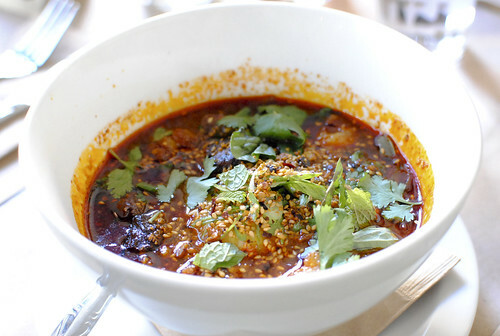 The soup was very flavorful and hearty, quite spicy too. I think these are the same meats as seen in “the original bäco” (which were delicious), and the noodles and egg were both good too. Kind of an odd mix of ingredients, but I think the soup came together well. A heavy starter, for sure. 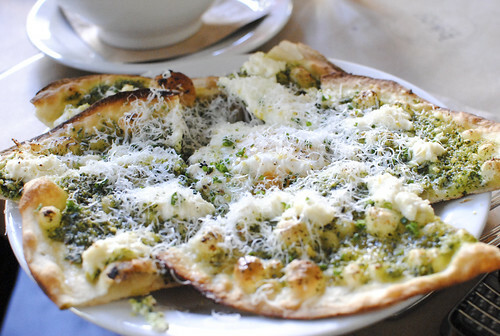 We tried one of the flatbreads – here, one topped with salsa verde, cheese and a fried egg. The flatbread was pretty thin and very crispy. Hard to go wrong when combined with salsa verde, fried egg, and cheese. Nothing special really, but tasty. We tried four of the baco sandwiches. 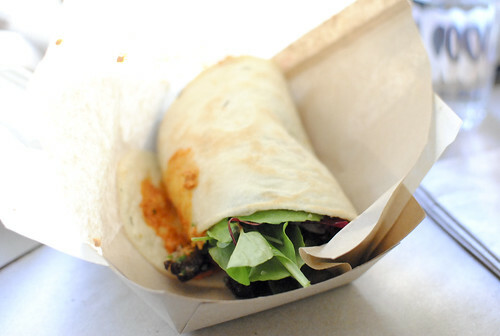 I liked the crispy, meaty pork belly and beef, and the smoky aioli sauce really bulked up the flavors. Leafy greens (I noticed spinach) helped to balance out the flavors. I could easily have mistaken the flatbread for a regular tortilla. A solid sandwich, the crispy shrimp was paired with a cabbage coleslaw. The sriracha-based sauce was almost overpowering, but it did add some heat and extra flavor. At $8 a pop, it won’t be displacing the fish/shrimp taco anytime soon. We were expecting warm, thick chunks of porchetta but this was actually made up of cold, thin slices of the pork. And no skin. Not my favorite, it didn’t feature much of the pork flavor I was expecting. Didn’t get a lot of flavor in this one either, I thought the slightly spicy sauce was the main flavor profile amidst the earthy tones. 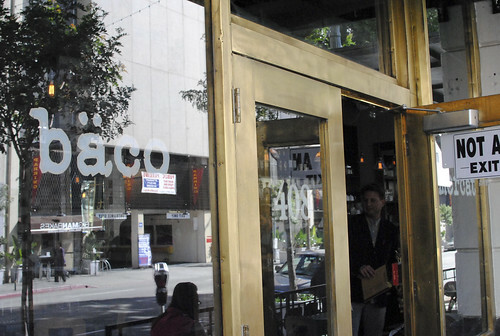 I had high expectations for Bäco Mercat, and my experience fell short of those. Maybe I just didn’t understand it, but conceptually I didn’t think the bäco were that interesting. All four had a very similar orange sauce that became monotonous when trying a variety, and I didn’t think the flavors of each baco stood out on their own. 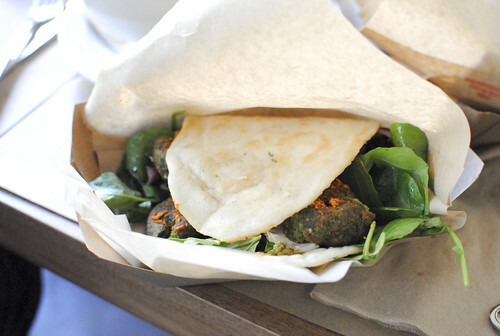 The flatbread itself resembled a thick tortilla, served lukewarm – it was fine. The restaurant is convenient to me so it’s hard to say I won’t return, but I don’t have any desire to at the moment. Oh, boo. I hope it will improve with time. Yeah, me too..I want it to succeed. It was just the soft opening, though it sounds like he’s been working on the baco for years. Haha yeah! Second lunch was Tsujita ramen…just posted..